This photo provided by Eric Sanders shows Texas shooting victim Cynthia Tisdale, top right, with her husband Recicie Tisdale, center and niece Olinde, left. Cynthia Tisdale, a substitute teacher who relatives say had a "lust for life" is among the first confirmed victims of Friday's mass shooting at a Texas high school. 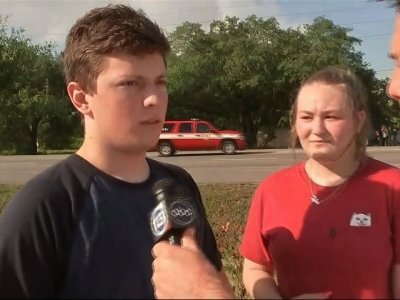 SANTA FE, Texas (AP) — A substitute teacher who relatives say had a “lust for life” and a foreign exchange student from Pakistan are among the first confirmed victims of Friday’s mass shooting at a Texas high school. Tisdale’s niece, Leia Olinde, said Tisdale was like a mother to her and helped her shop for wedding dresses last year. Tisdale’s house was the center for family gatherings, and she loved cooking Thanksgiving dinner and decorating her house, Olinde said. She said the program would be holding a moment of silence for the girl, who is pictured beaming in a shirt that says “Texas” in a photo being shared on social media. A bullet damaged the bone and a major blood vessel around Barnes’ elbow, which required surgery to repair, said David Marshall, chief nursing officer at the University of Texas Medical Branch. He said Barnes was in stable condition. Shubert told the Houston Chronicle that he then heard “three loud pops” before the attacker fled into the hall. Shubert says he realized he’d been wounded as he was running out the back door. Shubert says he was hit in the back of his head with what he says was a bullet, but that it “missed everything vital.” He also tweeted that he was OK and stable.